Footage from the CCTV cameras are directly fed to the town’s MDRRMO where personnel have been tasked to conduct regular monitoring. 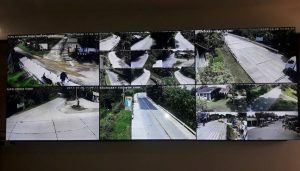 The local government unit (LGU) of Trinidad has installed closed-circuit television (CCTV) cameras in all of the town’s main thoroughfares in a bid to heighten security and as part of its drive against criminal activities. According to Mayor Judith Cajes, around 50 high definition CCTV cameras were mounted near the four boundaries of the municipality. Trinidad is bordered by the towns of Ubay, Bien Unido, San Miguel and Talibon. According to Cajes, the LGU through the town’s Municipal Disaster Risk Reduction Management Office (MDRRMO) shelled out P8 million for the project. The cameras were intended to monitor activities along major roads of the town and to hasten response time to emergency situations, she said. READ: San Isidro, drug-free soon? Footage from the cameras are directly fed to the MDDRRMO where personnel have been tasked to conduct regular monitoring.